The castle looms dark against the light of the moon. Giant ravens circle in the sky. The wind whistles through the empty windows. Merlin the magician needs someone to find out what has happened. But who is brave enough to brush the cobwebs aside and go through the heavy doors? Who is smart enough to solve the mystery of how the castle became haunted and return it to its rightful owners? Merlin thinks he knows the answer to these questions: Jack and Annie, two modern kids who have lots of experience with history, mystery, and magic! 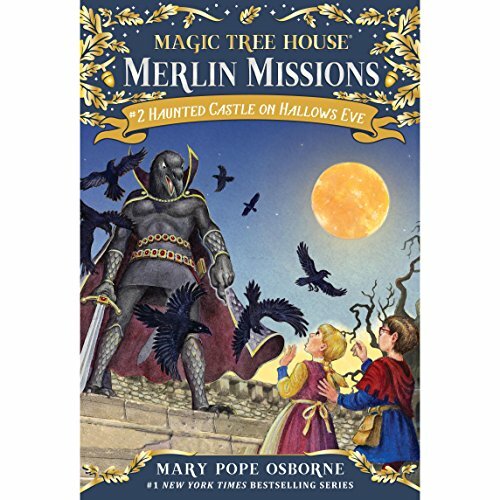 With the help of Teddy, a young sorcerer (and an old friend from an earlier adventure), Jack and Annie take on their second Merlin mission in the magical realm of Camelot. Inspired by ancient legends and campfire ghost stories, Haunted Castle on Hallows Eve is a spooky and satisfying treat for listeners all year round! My kids asked for Magic Lands (by Robert Stanek) and this is what I got by mistake. There are quite a few of these Magic Tree Houses. The books are short, about a boy and a girl named Jack and Annie who have a magic tree house. Cute kid stuff but not what my eight year old twins wanted. My son loved this book and the whole MTH series. There is a good mix of adventure with geographic and historic information. This is a great way to get your kids to love to read. We have them read the book first and then they can listen to the audio. Haunted Castle on Hallows Eve was one of his favorite stories in the MTH series.